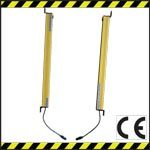 Safety light curtains are presence sensing safety devices that detect the presence of obstructions within the light curtain sensing field. These Active Optoelectronic Protective Devices (AOPD’s) are primarily used for machine guarding. Low cost, long warranty and quick delivery. Type 4 / Category 4. Made in the USA. 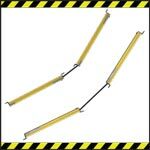 Safety light curtain with no 3rd box or controller. Pylons are rated Nema 4 (IP 65) and has two monitored solid state PNP outputs. Mechanical captive contact (dry) safety relays also available. Input power is 24VDC. Complete system diagnostics, mounting brackets and connection cables are supplied standard. Type 4 / Category 4. Made in USA. 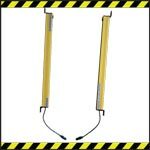 Safety light curtain with a free standing Nema 12 (IP 64) metal box controller and the pylons are rated Nema 4 (IP 65). Input power can be 110V, 220 VAC or 24 VDC. Excellent for free standing enclosure light curtain applications. Complete system diagnostics, mounting brackets and connecting cables supplied standard. Type 4 / Category 4. Made in USA. 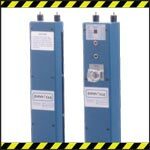 Safety light curtain with a DIN-rail mountable controller rated NEMA 1 (IP 10) for mounting into an existing control panel and the pylons are rated Nema 4 (IP 65). Input power is 24VDC. Complete system diagnostics, blanking capability, mounting brackets and connecting cables are supplied standard. Type 4 / Category 4. Made in USA. Designed to be supplied to any marketplace in the world. Light curtain with no 3rd box or controller. Unit is rated Nema 4 (IP 65) and has two monitored solid state PNP outputs. Mechanical captive contact (dry) safety relays also available. Input power is 24VDC. Complete system diagnostics, mounting brackets and connecting cables are supplied standard. Type 4 / Category 4. Made in USA. 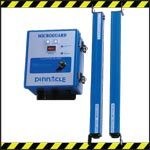 Free standing two pylon 110 VAC input power system with built-in monitored safety relays (dry). Multiple beam spacing options are available for arm and body detection. 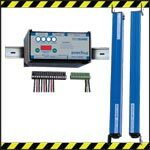 Model PPG is designed for perimeter guarding applications and incorporates latching safety relays (dry) with mounted manual reset button on the receiver pylon. Long scanning distances available. Type 4 / Category 4. Made in USA.